Topics: Text Directories, Graphical Directories, Try The Free Version, and Articles. Age: The domain is 15 years and 5 months old. 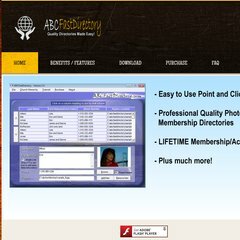 abcfastdirectory.com Picture Directory and directory samples created in seconds ..
abcfastdirectory.com Youth in the Church – why they are important and how to get them ..
abcfastdirectory.com How to increase your Church Attendance in a few small steps ..
abcfastdirectory.com Directory, Directories, graphical directory and church ..
234 users visit the site each day, each viewing 1.60 pages. The programming language environment is PHP/5.2.17. ns1.tera-byte.com, ns2.tera-byte.com, and ns3.tera-byte.com are its DNS Nameservers. Tera-byte Dot Com Inc (Alberta, Edmonton) is the location of the Apache/2 server.